Create a redundant power source. INTERNATIONAL Rectifier has introduced the IR5001S universal high-speed controller/N-channel power MOSFET driver for high-performance, active ORing circuits. 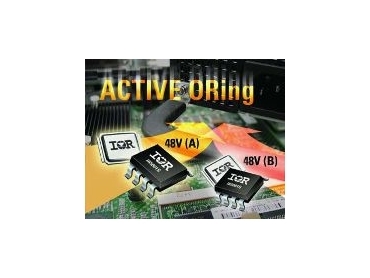 The active ORing IC, housed in an SO-8 package, is used with an external MOSFET, replacing traditional diode ORing to increase efficiency and reduce power dissipation. Active ORing is a key requirement for many high-end systems requiring maximum up-time, such as carrier-class communication equipment and telecom and datacom system servers. As a bonus, the IR5001S provides additional diagnostic features that increase system up-time, maximising quality of service. In the event of an input power failure, the active ORing circuit disconnects the non-functioning power source as quickly as possible to prevent the system bus voltage from falling, and to prevent large peak reverse currents.